Solar Cells are the basic building blocks of solar panels which are used to generate electricity from the sun.Note Solar Cells are made from Solar Wafers which are composed of Polysilicon the same material which is used to make your Electronic Products like iPods.While most people will never encounter Solar Cells since they buy and see Solar Panels,some enthusiasts want to make their own DIY Solar Panels.While in my opinion DIY Solar Panels are a Scam for people who are trying to save money ,its nonetheless a good thing for students and adopters.Its gives you an idea about how solar energy is converted into electricity.Note making solar cells is almost impossible for the layman so building your own solar panels requires you to buy solar cells.Nowadays solar panel prices have crashed making it easier to buy cheap solar cells on the market. 1) Tabbed Solar Cells – These Solar Cells come with Wiring which is needed to connect Solar Cells in a Series.Note most Solar Cells come with 0.5 Volt so you would need around 24 to 60 Solar Cells in a series to get between 12 Volts to 30 Volts which is needed by electrical appliances. 2) Untabbed Solar Cells – These Solar Cells do not have wiring and the wires on each individual solar cell has to be done by soldering them neatly.Note Untabbed Solar Cells are cheaper to buy than Tabbed Solar Cells with a pricing difference of between 20-40%. Note you can buy Solar Cells from the Internet if you are looking for a small order size.There are a number of solar cell retailers on the Internet who sell you small lots of different qualities.Note you can’t buy thin film solar cells,so when I am talking about buying solar cells I am talking about crystalline silicon solar cells.EBay is one of the best places to buy solar cells. If you are looking to buy Solar Cells in Large Sizes,then you can directly contact Taiwanese and Chinese Solar Cell Companies / Distributors.There are lots of Solar Cells Distributors who sell you different types of Solar Cells 5 inches ,6 inches Solar Cells as well as B Grade Solar Cells.Some Solar Cells have minor blemishes and are rejected during manufacturing of solar panels.These can be bought at half prices as well. You can buy Solar Cells for as cheap as 40c/watt though most big Chinese solar cell producers are selling it for about 65-70c/watt these days in bulk for good quality solar cells. A solar cell is an electrical device that converts light energy directly into electricity by the photovoltaic effect.Note Solar Cells can be made of many materials like Silicon,Cadmium Tellerium,CIGS and even on Organic Substrates.However almost 90% of the Solar Cells produced in the world currently are made of crystalline silicon.The drastic fall in prices of silicon solar cells has seen an explosive growth in demand with solar cell supply increasing by almost 50% per year in the last decade. The basic component to make a solar cell is silicon, which is not pure in its natural state. The silicon to be used should be 99.999999999% pure. So the first step involves purifying the silicon. The most common method is Czochralski method. Step1) To purify, it is first placed into a cylindrical electric arc furnace, where a carbon arc is applied to it. The pure silicon collects on the rod situated in the middle of the cylinder. However the silicon is still not that pure to be used any further. Step2) Hence the rod of impure silicon is passed through a heated zone several times in the same direction. This procedure drags the impurities towards one end. At a specific point, the silicon is deemed pure, and the impure end is removed. Step3) From the silicon boule, thin square slices are cut. Each such unit is the solar cell. Step4) Electrical contacts connect each solar cell to another and to the receiver of produced current. The contacts must be very thin so as not to block sunlight to the cell. Step5) Silicon is a very shiny material, hence very reflective. For this reason, an anti-reflective coating is applied to the top of the cell to reduce reflection losses to less than 5%. Step6) The cells are encapsulated and placed in an aluminum frame that has a glass cover. 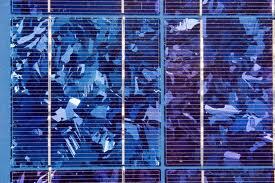 Assemblies of cells used to make solar modules are known as solar panels. Quality control is important in solar cell manufacture otherwise there can be adverse affect on the overall efficiency of the cells. During the entire silicon disk manufacturing process, the temperature, pressure, speed and other such factors should be continuously monitored. Solar Cells Efficiency can vary from 16% to 24% for the normal crystalline silicon technology.Note there are some solar cells made from exotic materials like Gallium which can produce solar cells of more than 40% efficiency .However these solar cells are for niche applications like Spacecraft and don’t make much sense economically.Solar Cells are of 2 types a) Multicrystalline b) Monocrysalline.Mutli Solar Cells have lower efficiency that the Solar Cells made from monocrystalline Solar Cells.However Mutlicrystalline Solar Cells have lower cost to compensate for their lower efficiency.Note most solar cell manufacturers are constantly improving efficiency in order to lower their costs and get ahead in this competitive solar industry.Sunpower makes the highest efficiency crystalline solar cells on a commercial scale. Solar Cells are of 2 types a) Multicrystalline b) Monocrystalline. Multi Solar Cells have lower efficiency than the Solar Cells made from monocrystalline Solar Cells. Solar Cells Efficiency can vary from 18% to 24% for the normal monocrystalline silicon technology. Multicrystalline Solar Cells have lower efficiency and costs than monocrystalline solar cells.However they are currently the more popular though that is changing.They have an efficiency in the range of 14-17%.